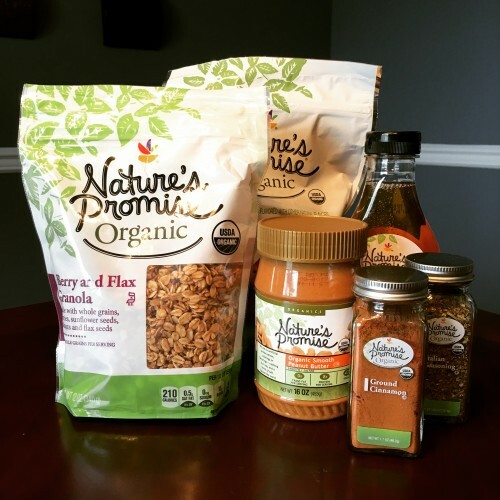 Disclaimer: I was provided Nature’s Promise products free of charge from Giant Food Stores. While the products were provided to me for the purpose of this review all the opinions are my own. Giant was kind enough to send me a great variety of products to try out, everything from spices and condiments to snacks and cleaning supplies. While eating organic isn’t necessarily a priority for us, we try to eat clean. I like foods with short ingredient lists and words I can actually read. We enjoy things that aren’t full of a lot of chemicals and artificial ingredients. 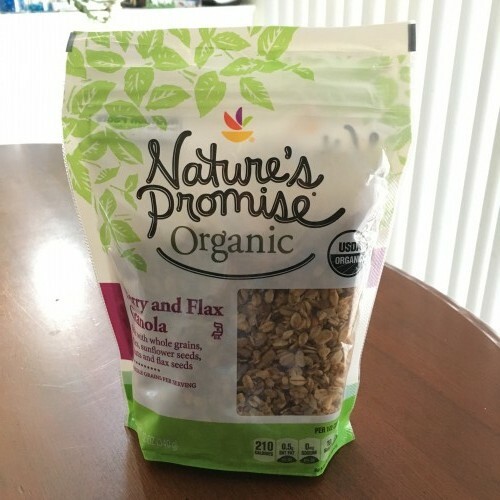 What I like about the Nature’s Promise products is that they don’t break the bank. Many people don’t try organic and natural products because they feel they can’t afford to, well Giant makes it possible for everyone to feed their families better and use more responsible products in our homes. Say hello to my afternoon snack. Chocolate animal cookies and peanut butter. If you are accustomed to JIF or Skippy, the Nature’s Promise Organic Peanut Butter might through you off. First, it separates. There is a thin layer of oil on the top that needs to be stired in. If you’re not used to a natural peanut butter you might find it a little bland. 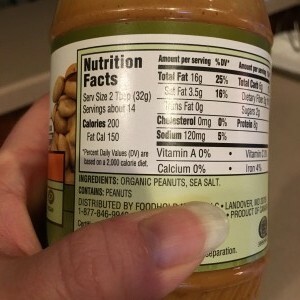 All that goes into making a jar of Nature’s Promise Organic Peanut Butter is organic peanuts and sea salt. That’s it! No sugar, no hydrogenated oils, this is peanut butter in it’s purest form. I have never had chocolate animal cookies before and I have to say, WHERE HAVE YOU BEEN ALL MY LIFE?!? Together these two make a great snack. Another great afternoon snack is Greek yogurt and Nature’s Promise Berry & Flax Ganola. Add a little honey and stir for pure perfection and that much needed afternoon crunch. 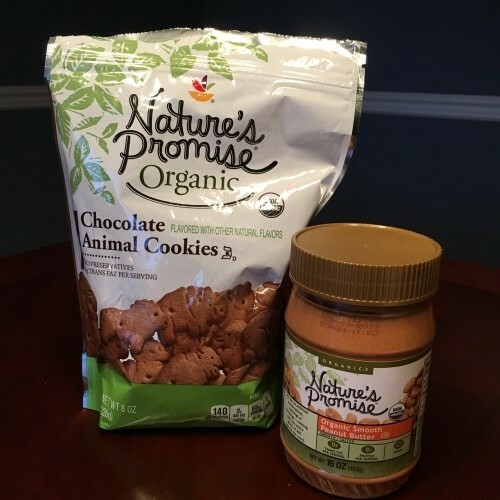 I was also given the opportunity to try out some non-food items from the Nature’s Promise Free From line. The hand soap was something that I needed to warm up to. The first time I used it I missed my hand entirely because it’s very watery so firm pressure on the pump sends it flying. Despite being watery, it cleans well and smells great. Another BIG plus for me is that it doesn’t dry out my hands. 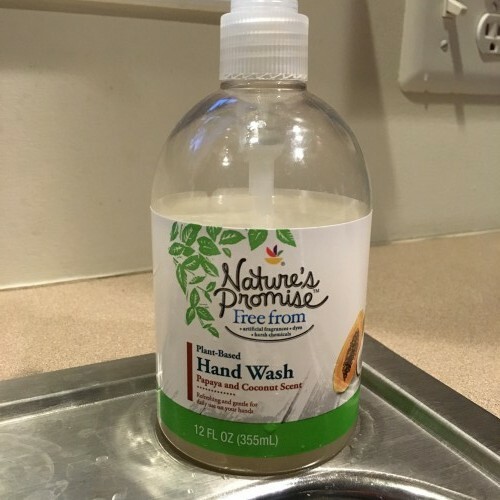 This hand soap is free from from artificial fragrances, dyes, harsh chemicals, paragon, sulfate, triclosan and phthalates. It has a relatively short ingredient list that includes plant extracts. My favorite test item was the candle! My only gripe is that I wish it was bigger. 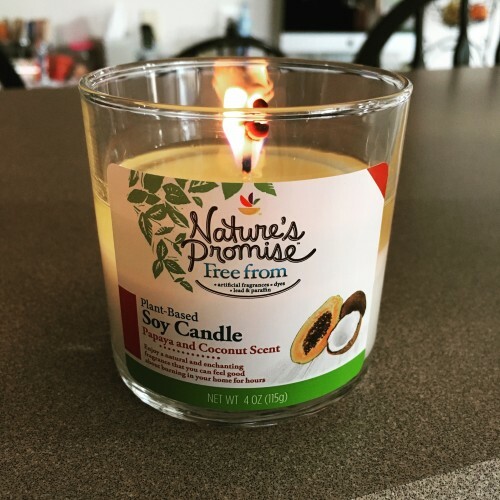 This plant based candle smells like summer. The candles I usually burn are the big, three wick kind so I wasn’t expecting much from this little 4oz candle. Boy was I surprised! Before long my house was filled with the summery scent. Being free from the chemicals and artificial fragrances and dyes makes me feel better about burning in the house with the kids and animals. 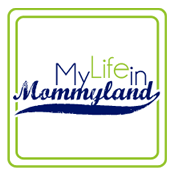 I’d love for you to try out some of the more than 800 different Nature’s Promise products and Giant would like to make it easier for you to just that. One lucky winner will receive a $25 Giant gift card. It’s easy to enter, simply use the widget below. Good luck! I’ve been interested in essential oils and what they can do for me for a little while. I see friends on Facebook singing their praises and I hear about them from people I know. Could they really live up to the hype? One day I decided to bite to bullet and give essential oils a try. I have plenty of friends who sell them for some of the big EO companies so I looked into placing an order. That’s when I realized that maybe I couldn’t afford to give EO’s a try. With 10ml running between $15 and $50 I was out. I let my fingers do the walking to find out what I needed to look for in an oil and I learned that they need to be 100% pure with no added ingredients like alcohol or fillers. I did a little search for the top brands as well. Of course I wasn’t surprised that those expensive brands were at the top, but I found a brand that made the list with it’s only downfall being that they have a small selection. That is when I met Fabulous Frannie. The EO’s at Fabulous Frannie are all the top quality I was looking for but the price tag was something I could live with. Many of the oils run from less than five dollars to about fifteen dollars. Of course there are some pricier ones too but I can find most of what I’m looking for for $5 to $10. Being new to oils they seem to have a decent selection. Not only do they offer essential oils but they have blends, roll-ons and so many other things. I’ve found that many of the products run on a buy three get one free sale which has really helped me grow my EO collection. What started as a six pack of popular oils is now eighteen oils and four roll-ons. 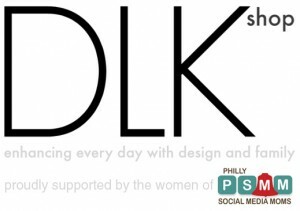 When I shop on the Fabulous Frannie website I feel like I buying from a small business, like one I’d find right here in my little hometown. I’ve really had pace myself with my orders, there are so many great things on the Fabulous Frannie website and the prices are so good that it’s easy to get carried away. On my Fabulous Frannie wish list is the diffuser, sure I have one but this one is so pretty. I also would like a travel bag so I can safely take a few of my favorite oils with me. Of course I need to continue and grow my collection of oils so I have what I need for all that ails us. Maybe a few more blends and of course some more roll-ons. I love the roll-ons so much that I’ve all but stopped wearing regular perfume. 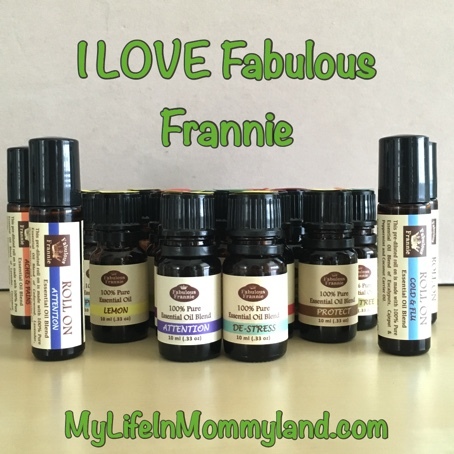 If you’re looking to get into essential oils but you don’t have the budget to buy them from the big names out there, give Fabulous Frannie a try, I don’t think you’ll be sorry. Disclaimer: I was not asked to talk to you about Fabulous Frannie, I have paid for all of my own oils myself. This post is not sponsored by Fabulous Frannie in any way, I only wanted to share a great product that I love with you.